Slippers, an umbrella and a coat stand lend a touch of class to this fully-furnished bell tent in Kent. Each tent is uniquely stylised and accessorised with themes/names like; Alice in Wonderland, Romantic Ratten, Under the sea, Farm yard Friends, Colourful Scandi & 70’s soft filter! Bell tents are fully furnished with everything you need for a comfortable stay including a comfortable double mattress bed and linen, king-size duvet, six pillows, bottom sheet, throws and hot water bottles. Fantastic kids' bunk beds are also available. The tents are internally lit with solar and LED lighting and also contain bedside tables, an Ottoman trunk box filled with blankets, rugs, a cool box, crockery box with cutlery, frying pan, saucepan, washing up items, BBQ equipment, glasses and wine glasses as well as a vanity mirror, coat stand, books, board games and surprises - not to mention slippers and an umbrella! Fridges for ice packs are available at the main house. Outside the tent, you'll find a fire pit, pop-up grill, camping gas stove and outdoor seating. 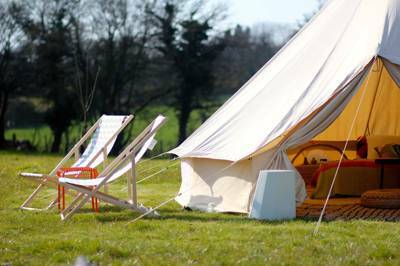 The Bell Tent is priced for two sharing adults but other beds can be added at additional cost. Extra awnings, event shelters and separate external store tent for food and luggage are available as an add on if required, email us your requirements. A wood-fired pizza oven will be available for making your own pizzas and the shop will stock essential items such as wood, kindling, fire lighters, head torches, organic meats, raw milk from the local diary and quirky local crafted items. A range of freshly made coffees available.